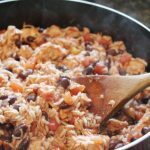 One Dish Mexican Chicken And Rice is a delicious and flavorful meal, made in one pan. Completely easy to make and it is a healthier dish to feed your family. Serve in a tortilla or with chips, your family will love this supper! I may or may not talk a lot about taco related food dishes on Baking With Mom. It’s kind of my thing. I also love inventing new taco like dishes for my family to eat. They like it when I invent taco like dishes because then they aren’t eating just plain tacos. Of course, they love just plain tacos, but my fondness of tacos makes it so we eat them a lot. They do like a little bit of variety. I put together this meal last minute, adding ingredients as I went. I had some chicken I had cooked and frozen and used two chicken breasts for it. I also wanted rice, knowing some of my family would eat this with tortilla chips and others with a flour tortilla. I tried it both ways and it was delightful. You can certainly just eat it with a spoon. The ingredients are basic: beans, tomatoes with chili’s, rice, chicken and tomato sauce. You can add cheese if you would like. I opted not to (gasp, I know). We add cheese to most things but went the cheeseless route this time. It had to happen sometime, ya know. I used my favorite pan for one dish meals, the Rachael Ray deep skillet. I can cook a lot of food in there (enough to feed a hungry crew of 6!). The One Dish Mexican Chicken And Rice makes a lot so you will have leftovers. Great for lunches the next day. Actually, if you wanted to make up a big batch of chicken recipe for lunches, your family will love you for it. Just be sure to pack the chips. 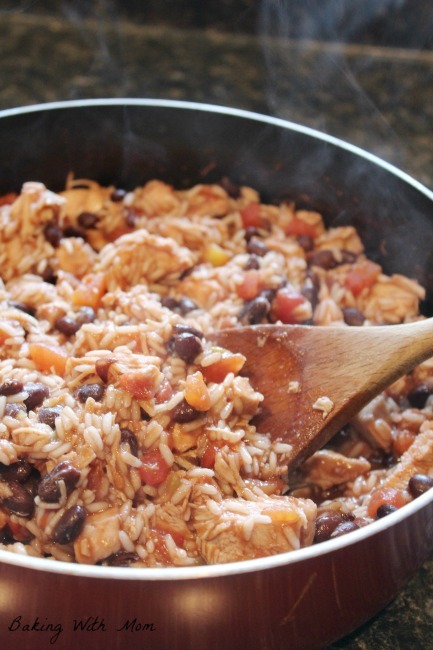 One Dish Mexican Chicken And Rice is a delicious supper recipe your family will appreciate. Made in one pan, add ingredients your family will love.